This Harvey Wallbanger riff was inspired by Cari Hah’s memories of drinking Orange Julius smoothies as a kid. 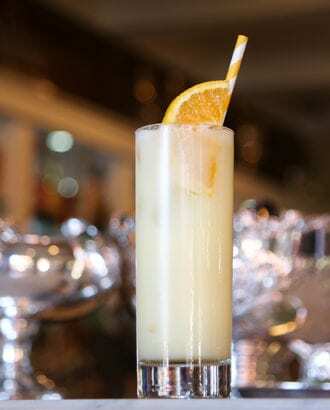 Galliano and genever balance out the sweetness of orange and pineapple juices beautifully. Combine everything except the soda water in a tin and shake with ice. In the bottom of a Collins glass, pour ½ oz. of soda water. Strain the contents of the shaker tin into the Collins glass on top of the soda and add ice to fill the glass. Top with the remaining ½ oz. soda.